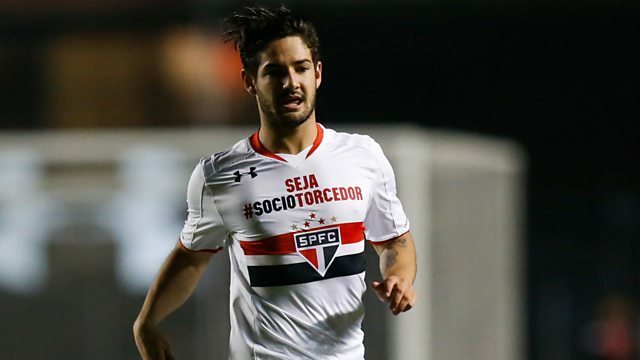 The BBC's South American football expert Tim Vickery says that big clubs are “playing poker” with Brazilian striker Alexandre Pato, who is rumoured to be joining Chelsea. Pato has endured mixed reviews after spells with Inter Milan, AC Milan and Corinthians but now, according to Vickery, the 26-year-old is again being touted to Europe's top clubs. "Corinthians are desperate to get him off the wage bill - two agents are going round England trying to sell this player," Vickery told Mark Pougatch on 5 live Sport. "There is real scope here for a buying club, be it Chelsea or someone else, to play poker and get this player for a price so low that he will be a steal." This clip is from 5 live Sport on Wednesday 20 January 2016.